Checking the flowering status of Sophora on some streetscape work, I really had some excellent lighting. I remembered that S. x ‘Silver Peso’ wasn’t specified, but rather it was S. x ‘Sierra Silver’. Photos from Picacho Mountain, celebrating daylight savings time, 3/12/2017. That’s on Anthem Road, the first area one sees before buying a lot, or returning home. I’ll need to dig out some earlier photos, before the demise of flowering groundcovers among the agaves and some other accents. There were some good combos that are tough and reproduce madly, but not with roundup or lacking initial rabbit control. I’ve been blamed on not using rabbit-resistant plants, no matter how explained. Yet these native volunteers of Aristida purpurea are appreciated and their forms left the best way between the boulders and under the Yucca faxoniana. You may have spotted a few maintenance issues on your own by now. “Giving most landscape maintenance people your trust here is like giving whiskey and your Porsche’s keys to teenaged boys.” – my local adaption of Wasowski ala O’Rourke. 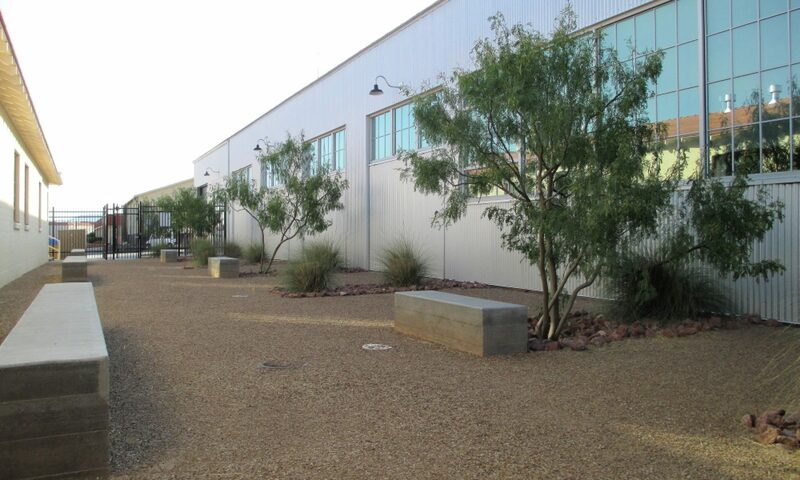 Desert plants used well offer an understated elegance. The low lighting really added some drama on this secondary neighborhood entry. About a half-mile away over the hills, onto Calle Vigas. Agave neomexicana is also elegant – not the most interesting agave to many, since it isn’t zone-pushing, unusual, or glamorous enough. But it’s our’s, so just use it well and experiment well with it. After a few years in my own garden I was blessed to own, I got such things right after enough cuts and flesh wounds. Then I was free to unleash such things correctly the first time on loads of “paying projects”! Looking back on the original development on Anthem Road, sunset! The Sophora there and on nearby plantings are barely blooming, just a little higher…maybe 4200′? Looking more closely, I only wish I could bottle up the fragrance for you of each Sophora x ‘Sierra Silver’. But I did sacrifice life and limb on these bloom close-ups versus a rather territorial carpenter bee.